Calcium is vital for the formation of strong bones and teeth, and for the maintenance of healthy gums. 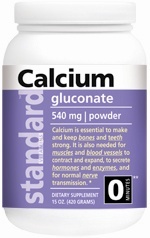 Probably the most well-know benefit of calcium is its role in preventing osteoporosis. The body stores more than 99 percent of it in bones and teeth to help make them and keep them strong. The remainder is stored throughout the body in blood, muscle and the fluid between cells where it can assist muscles and blood vessels to contract and expand.